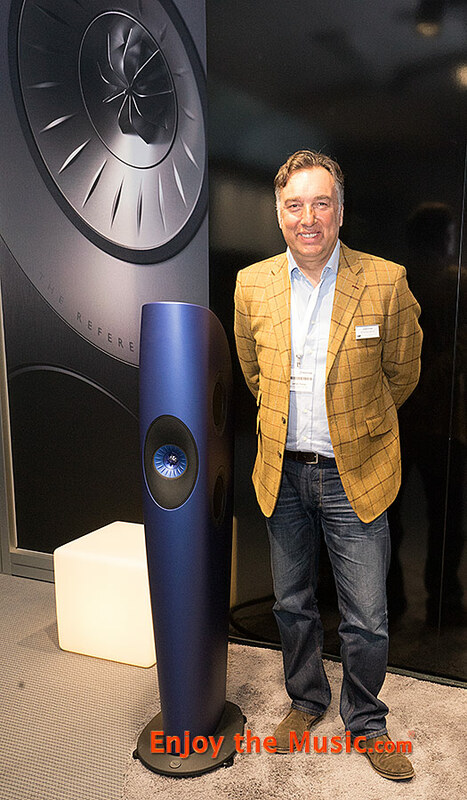 Great guy Johan Coorg, a man who is always fun to be around during shows, is proudly standing next to KEF's Blade Two floorstander (�20,000 per pair). With over 50 years of design and engineering within the high fidelity audio loudspeaker sector, KEF continues to create and innovate. The company feels that it is always best to allow their engineers free rein to create the best drivers to bring together to achieve excellence. Their Blade series has come to the forefront over the years and now their Blade Two is making its debut here at HIGH END 2015 in Munich. KEF's original Blade design has already earned many prestigious awards, and now with their second model, Blade Two, they have once again brought together their engineering prowess yet on a physically smaller scale than the original Blade floorstander. Being a smaller size, KEF's Blade Two is easier to position where space is at a premium. Blade Two employs the same 'DNA' as its larger sibling and uses the same advanced driver technology that ha s a very unique single audible source configuration. There are four bass drivers 6.5" bass drivers, two on each side of the cabinet, and of course KEF's Uni-Q HF/MF coherent source array. A very stylish parabolic enclosure has very creative new venting, which you can see within th above photo. Careful attention has been paid to bracing and wave management too. Furthermore, KEF chooses to 'over-spec' parts so that each and every component operates very comfortably within its performance envelope. Blade Two cabinets are available in a palette of visually seductive finishes including Piano Black, Snow White, Warm Metallic Grey, Light Metallic Silver, Racing Red, along with two specially commissioned 'Kent Engineering and Foundry' finishes, which celebrate KEF�s unrivalled heritage of continuous innovation for over 50 years. Frosted Blue, as seen within the top photo, hints at the blue of the original KEF logo. Another option is Frosted Copper Black for a truly stunning visual appeal. 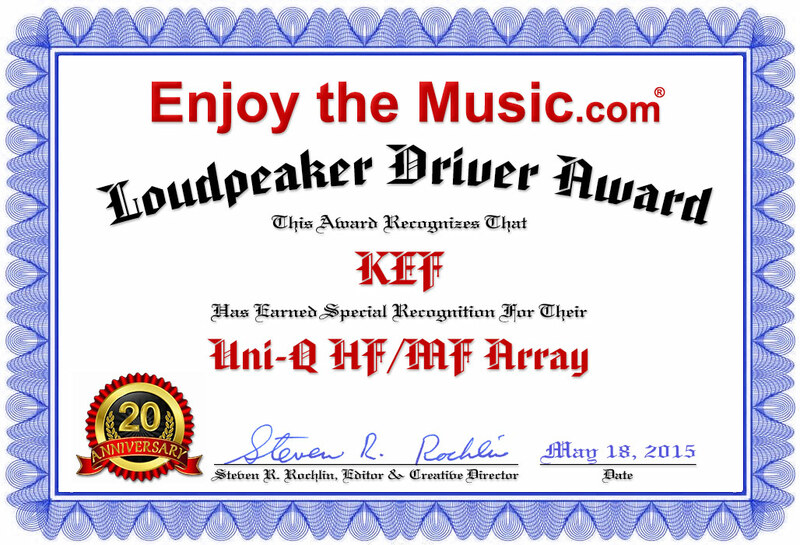 Have always loved KEF speakers and one of my long-term faves was their 104/2 time/phase accurate small floorstander. 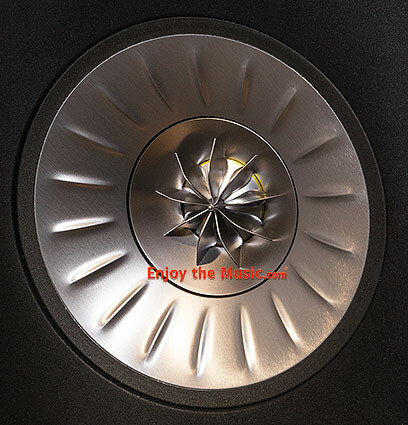 Within Enjoy the Music.com's TV studio we have a pair of KEF LS50 that features the magnificent in both sound and visual styling Uni-Q HF/MF coherent source array as seen above. During shows, Johan Coorg is always game for playing music you provide and without a doubt a fun time is had by all. 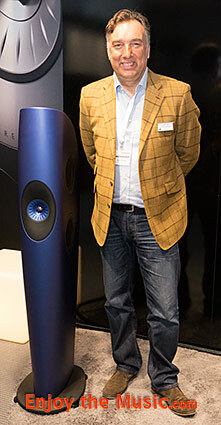 I always look forward to enjoying music within the KEF room as the KEF Blade Two are an outstanding and remarkable achievement!